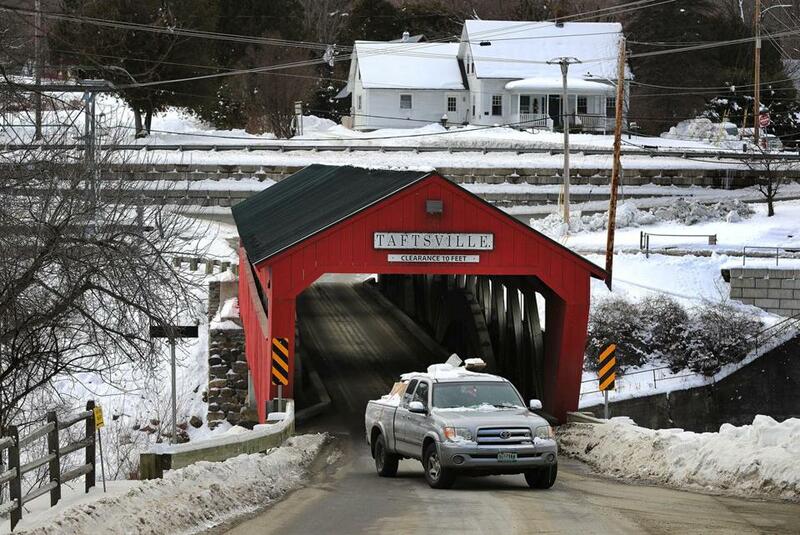 A large pickup truck exited the Taftsville Covered Bridge in Woodstock. WOODSTOCK, Vt. —It’s a state that prides itself on purity: its pristine land, progressive politics, even its ice cream. But 14 years later, the zeal in the Green Mountain State has yielded not so much cleaner air, but embarrassment. A report released last year found that emissions had actually increased 16 percent over 1990 levels, a startling divergence from the goal. 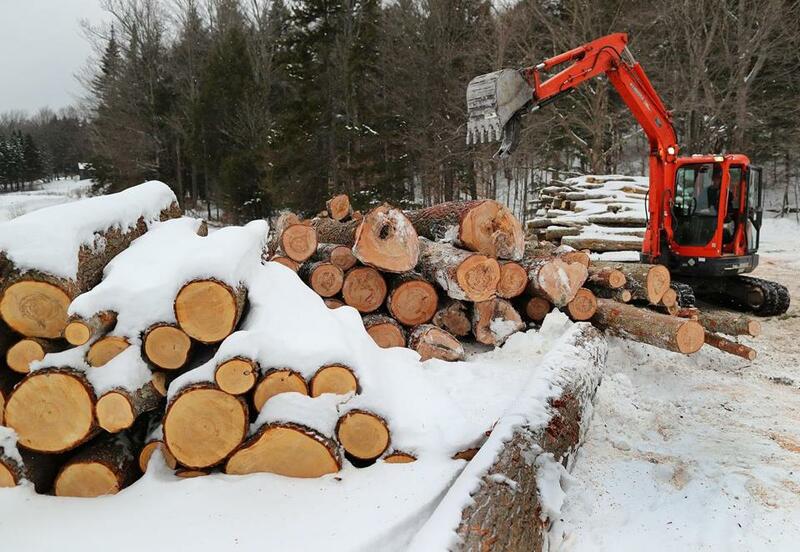 A loader piled cut logs on the property of Morse Farm Sugarworks. The state’s failure to reduce emissions reflects the steep challenges in the way of radical energy efficiency, particularly at a time of low gas prices and strong economic growth. It isn’t the product of organized opposition but of up-country habits. Among the factors tripping up the state are the preference for gas-guzzling pickups in rural parts and the reliance on wood for heat. The failure to meet its lofty goals has implications far beyond Vermont, a reminder that far more sweeping changes will be needed if such goals are to be met, here and across the nation. In October, a report by the United Nations Intergovernmental Panel on Climate Change found that global emissions must drop by nearly half by 2030 for the planet to avoid the most dire consequences of global warming. Morse Farm Sugarworks owner Burr Morse stopped his ski touring business due to unpredictability of weather he blames on climate change. The nation isn’t coming close to meeting such targets. A preliminary analysis released this month by the Rhodium Group, a research firm in New York, found that carbon emissions in the United States rose by 3.4 percent last year — the second-largest annual gain in more than two decades. It was surpassed only in 2010, as the nation emerged from the Great Recession. In Vermont, long, frigid winters demand a lot from the state’s power plants, a challenge that increased in 2014 when the state’s only nuclear power plant closed. Drafty old homes are another source of waste and an example of the need for increased emissions, as are the state’s many wood-burning stoves and dairy farms. Natural gas has replaced dirtier fossil fuels such as oil and coal, yet most emissions are coming from the transportation sector, mirroring the national trend. In 2015, exhaust from trucks and cars was responsible for more than 43 percent of Vermont’s emissions, according to the state’s latest statistics. Much of the blame falls on the aging pickup trucks, the state’s most commonly registered vehicles, which many residents often drive alone. The state also has a disproportionate number of tourists who clog its mountain roads on their way to ski resorts or leaf peeping. 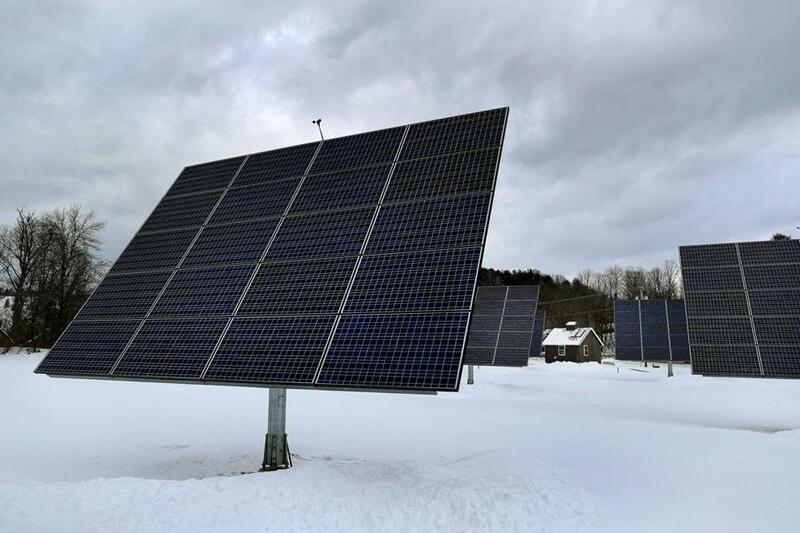 Solar panels lined a field on Route 12 owned by the Woodstock Aquaduct Company. A 2017 state report found that Vermont drivers log significantly more miles than the national average, a rate that was increasing more than twice as fast as in other states. With sparse development and little public transit, Vermont was 11th highest in the United States in terms of the amount of miles driven per resident, the report found. Among them are programs to help improve energy efficiency in homes, financial incentives for electric vehicles, and protections for the state’s forests, which are in decline for the first time in a century. Although some environmental advocates have criticized the report as tepid and said that Scott has done little to implement its recommendations, Walke said the administration is poised to take action. “We’re going to start seeing things being rolled out soon,” he said. In 2016, the state set a new goal of obtaining 90 percent of its power from renewable energy by 2050, and it recently joined eight other states, including Massachusetts, in a landmark agreement that seeks to impose a regionwide limit on transportation emissions. The report to the governor also found that the state has already started experiencing the effects of climate change, including a surge in tick-borne illnesses, a rise in dangerous, invasive species, and more intense storms. Much of Woodstock, for example, was devastated in 2011 when Tropical Storm Irene triggered landslides and floods, damaging critical roads, historic covered bridges, and many homes. Climate scientists expect that similarly intense storms, with bursts of rain and flash flooding, will occur more frequently as temperatures rise. Warmer winters have also led to less snowfall. Over the past century, average annual temperatures in Vermont have risen by more than 2.5 degrees, and the warming has been accelerating in recent decades, shortening winters and substantially reducing the number of days when snow covers the ground, according to state and federal reports. Those unpredictable conditions have wrought havoc on the state’s ski resorts, requiring expensive investments in making snow, and leading one to announce a few months ago that it was shutting down. This month, the nearly 10 miles of cross-country ski trails were empty. 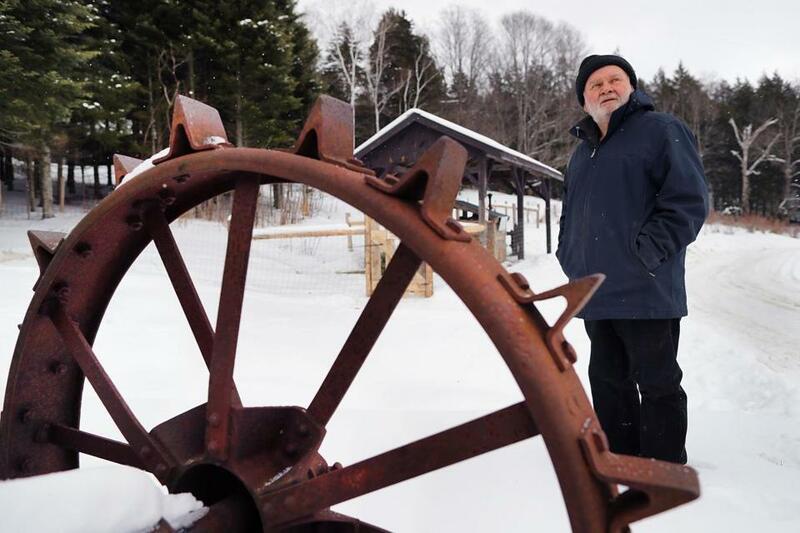 Morse plans to focus on his maple sugar business, which has also struggled with the effects of climate change. Without enough days below freezing, the sap doesn’t flow as well as it used to, he said. The concerns about climate change also helped spur a wave of candidates who were swept into the Legislature this month on a mission to curb emissions. At the same time, some Vermonters are trying to reduce their own carbon pollution, and at no small personal expense. Geoff Martin and his wife, Olivia, recently took advantage of existing state incentives to improve the efficiency of their two-bedroom home in Woodstock, adding insulation to their drafty attic, sealing their chimney chase, and installing solar panels and heat pumps. They received a no-interest loan and grants for the work. They hope lower utility bills will allow them to recoup the $7,000 they spent within a few years. “Everyone has to do this, if we’re going to reduce our energy consumption enough not just to meet state goals but to avoid the worst impacts of climate change,” said Martin, who works as an energy coordinator for a nearby town. Andy McLaughlin inspected the energy system in his zero-emissions prefab home that was built in 2015 in Woodstock. A few miles away in Hartland, Andy McLaughlin decided to buy a new home from a Vermont company that sells modular houses it says produce zero emissions. 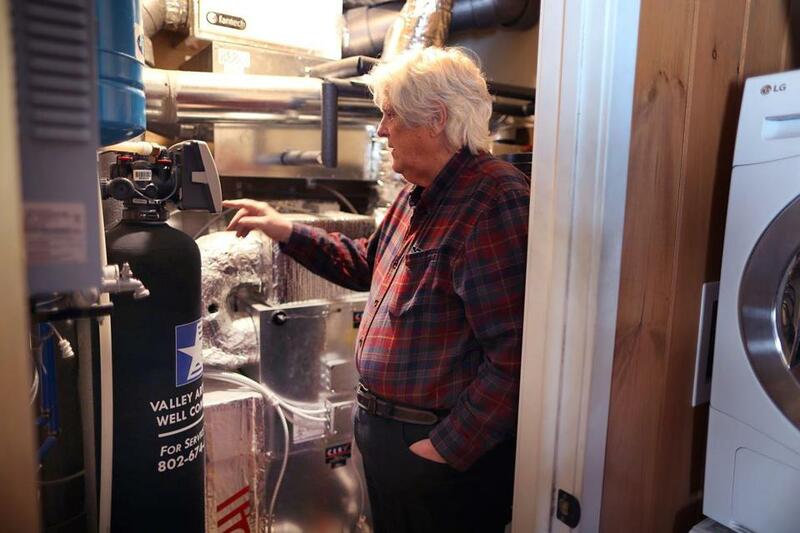 His 1,800 square-foot home, one of 90 sold over the past six years by the Wilder company Vermod, has thick walls, triple-paned windows, temperature sensors in every room, specially engineered wood floors, and a range of energy efficient appliances and heat pumps connected to solar panels on the roof. At a cost of about $350,000, it was a significant investment for the 77-year-old retired professor and his wife, but a worthwhile one, they believe.